Successfully Added Colawe R1 E-Reader - 6-Inch Display, Linux OS, Wi-Fi, 8GB Memory, Backlit Display, 180 Degree Viewing Angle, 1900mAh Battery to your Shopping Cart. The Colawe R1 is beautiful and sleek E-reader that allows you to carry along hundreds of your favorite books in one device anywhere you go. Perfect for on the go, during your upcoming holiday, or to simply enjoy a good read at home – the Colawe R1 truly is a device that keeps you entertained for years to come. Featuring 8GB of internal memory, you can be assured that this E-reader offers plenty of space for you to store all your favorite stories – allowing you to literally carry along years worth of good reads at any time. Featuring a beautiful 6-Inch E-Ink touch screen, the Colawe R1 allows you to efficiently browse through its features. 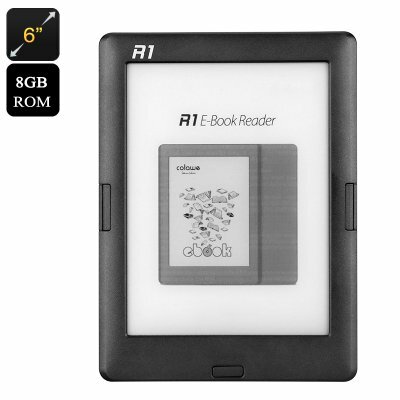 With its 167PPI, this E-reader lets you enjoy your favorite stories in a clear gray scale 16. What really sets the Colawe R1 e-book apart from its predecessors is its built-in backlight that features 10 adjustable brightness levels. From now on you’ll be able to read the best books and wonder off into a world of fantasy even while located in a pitch black room – making this E-reader perfect to be used while camping out in the wild or for reading in the bedroom without disturbing your partner. Running on a Linux operating system, the Colawe R1 E-reader is guaranteed to deliver a smooth and powerful performance – allowing you to undergo a great user experience. Besides allowing you to read all your favorite books, this magnificent little ebook also allows you to browse the web thanks to its Wi-Fi connectivity. Read the news, use Google, or download new ebooks – with this Wi-Fi E-reader your possibilities will be limitless. Coming packed with a sophisticated 1900mah battery, this E-reader allows you to continue reading for days in a row without you ever needing to worry about running out of juice – making it perfect to carry along during your upcoming road trip or holiday. No matter where you’re headed next, with the Colawe R1 E-reader you’ll always be able to carry along hour’s worth of books and stories – ensuring that you’ll never have to be bored again. Whether you’re stuck in a train for the coming hours, are camping out in the wild, or simply like to enjoy a good read in the comfort of your own living room – with this e-reader you’ll always be able to enjoy your favorite books and browse the web at any given moment. The Colawe R1 E-reader comes with a 12 months warranty, brought to you by the leader in electronic devices as well as wholesale electronic gadgets..
Arabic: - ﻫ-القارئ - Chinese Simplified: - 电子书阅读器 - Czech: - E-Reader - Dutch: - E-Reader - French: - E-Reader - German: - E-Reader - Hebrew: - E-Reader - Hindi: - ई-रीडर - Hungarian: - E betű-olvasó - Italian: - E-Reader - Japanese: - 電子書籍リーダー - Korean: - E-리더 - Malay: - E-pembaca - Norwegian Bokmål: - E-leseren - Romanian: - E-Reader - Russian: - E-читатель - Spanish: - E-Reader - Thai: - E อ่าน - Turkish: - E-okuyucu - Vietnamese: - E-Reader.